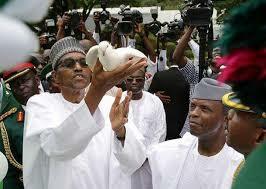 For the second year, the dove refuses to fly, Why are the doves refusing to fly? When the number one citizen already partitioned the nation on 97/5% basis, why do you use pathetic on the wrong people? Buhari remains Nigeria's President and there is nothing anyone can do about it for now. Now this is where 'pathetic' comes in because we are fighting a just course which is genuine and sure because Biafra our new country is alive and nobody can succeed in sabotaging it this time despite all their deadly plans to silence the voice of righteousness which has been yearning for the freedom of the realisation of Biafran land. This is Biafra the Israelites of Africa and what we stand for is the Truth and nothing else.